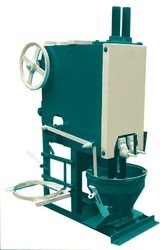 We are leading manufacturer of Mirchi Kandap Machine. Owing to our vast industrial experience in this domain, we are devotedly engaged in offering wide gamut of Mirchi Kandap Machine. This machine is manufactured with the help of premium quality material and contemporary technology in compliance with set industrial norms. It is useful in crushing chilly, coriander, spices, ayurvedic medicines, fragrance stick material, etc. Clients can avail this machine form us at market leading prices.